Nepal has moved eight positions up in the latest report of Democracy Index after the country successfully held three levels of elections last year. Nepal has been placed in the 94th position among 167 countries listed by The Economist Intelligence Unit. Nepal was in the 102nd position last year. “Nepal successfully held a series of local and provincial elections under the constitution that was ratiﬁed in 2015,” reads the report. Norway tops the chart whereas North Korea is at the bottom. 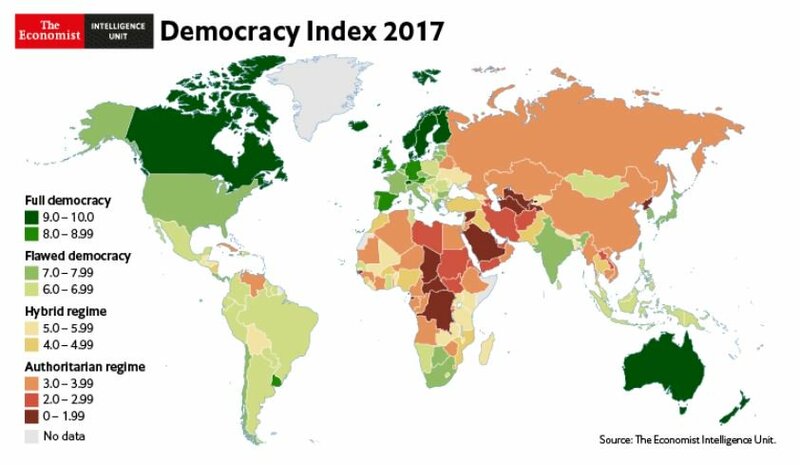 The index categorises the countries in four categories: full democracies, flawed democracies, hybrid regimes and authoritarians. Nepal is in the third category. Among Nepal’s neighbours, India and Bhutan are categorised under flawed democracies whereas Bangladesh is a hybrid regime. Pakistan has been listed under authoritarians.